At left are two compressor sections each of the five stage Rx8 configuration. One assembled the other stacked separately. Look closely to see the zero tip clearance stators. 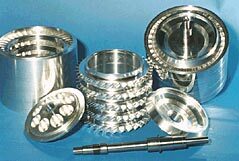 All these components are machined from solid bar stock of various alloys. The first use of axial flow compressors for automotive supercharging was by Norman Latham Of West Palm Beach Florida in 1956. This unit was known as the Latham Supercharger and was sold until 1965. These were built with a sheet-metal blade installed into a ring and locked by another ring. Very clever way of getting a wing into a disk. Trouble was there was no aerodynamic shape and the time to build was totally unacceptable. These were made for almost all cars being produced at that time. They were supplied with Carter one barrel side draft carburetors. In two and four carb set ups. There were over 600 produced. Most are still in running condition and sell at a premium on the vintage car market. The Latham company was sold to Richard Paul in 1982. At that time the old design was abandoned for a more modern design that included true aerodynamic shapes to the blades. A new method of construction was also devised. The use of lost wax casting was utilized. In general appearance the two superchargers might look the same to an untrained eye. However looking closer there are major differences in the two. Aerodynamically shaped volutes are used on the new design. Carburetion is done in modern style with Weber side draft carbs as well as Four barrel types. Electronic fuel injection was utilized in the last of these to be produced in the early '90's. Production of the cast units stopped in 1990. A new method of producing blowers was devised building the whole unit from billet bar stock. This was very superior to any other method so far. This allowed for any size or shape of wing to be utilized. Thus a true turbine like shrinking area compressor was available at a reasonable price. Trouble was that price was not reasonable in aftermarket automotive terms. While several of these were made in different sizes for specific applications there was not enough of a market at that cost. Another size was experimented with at that time. Since the new method allowed for increases performance a smaller package was designed. Three of this type were produced in prototype form. These were an inch smaller in diameter than the production units. 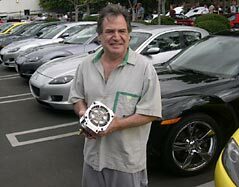 In 1997 after realizing that the future belonged to the sport compact market Mr. Paul designed an even smaller unit. No longer having the facilities to build superchargers Richard sought out someone who could manufacture some prototype parts. This lead to the introduction of Dana Cox to the formula. The first work done by the two was actually a full size 1800 CFM unit from billet for a 600 cu in aircraft engine. From this experiment came some fresh ideas for the manufacturing presses. This idea was married to the newest compact design and the current blower was the result. This unit now uses four of five stages and an internal planetary gear set. Weighs in at about 12lbs, is 5 in diameter and about 10 inches long. Thus came Axialflow Engineering Co. The first application was directed at the new Mazda RX-8. This is proving to be a big development project but a drivable prototype is expected shortly. The interaction with Mazda owners and tuners led to the interest in the car itself and the production of other components was by popular demand. Currently the Short Shifter for RX 8's is available. Under development for the future are several products, among them Four way strut brace for the front and a rear brace as well. Additionally is a master brake brace and center body tie brace. Our interest in developing this car will continue to produce new ideas and product.